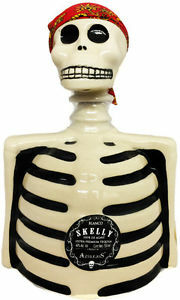 Los Azulejos Crystal Skeleton Blanco Tequila is produced in Jalisco, the heart of tequila country. 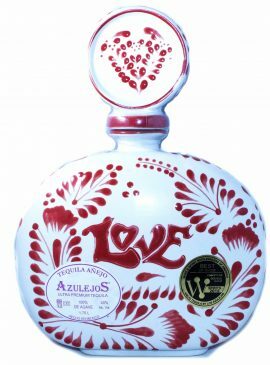 Los Azulejos Tequila is produced in Jalisco, the heart of tequila country. This is the youngest expression of this particular line. The others being Reposado, and Anejo and Extra Anejo. Distilled in stainless steel stills, a bright taste Lowland tequila. “Agave Tequilana Weber variety Azul”, commonly called blue weber agave or tequila agave. Steaming is followed by crushing in a shredder/roller mill and natural yeast fermentation is done in a slow to medium 48-60 hour procedure, in 30,000 liter stainless steel tanks. Distilled water is used to bring it down to 40% abv. Swirling in glass leaves a very light coating on the glass which then seems to almost evaporate off the sides. Agave note on the nose. All the right elements right at the start: savory, citrus lime, pineapple, then mineral salts, earthy desert. Develops quickly, grabbing your attention. Finish is bracing and very smooth. Finish is dry but with a bright taste, pepper notes touches of leather. Very clean tasting. No burn. This tequila could be trouble – it’s so smooth things could happen. Wonderful margaritas, be sure to use fresh juice and Grand Marnier, anything less would be an insult to the tequila and a waste. Delicious, smooth, and true BLANCO tequila delight.